The development, workings and use of this key test machine. Although originally developed as a whole shoe sole abrasion testing machine, the SATRA STM 528 Pedatron has also been found to be an effective test machine for the assessment of a number of other footwear characteristics. In its original use, the Pedatron was developed to provide an alternative to long-term user trials for soling assessments. In order to achieve a realistic wear assessment, the Pedatron was developed to closely replicate the action of walking, with parameters determined from biomechanical studies of walking gaits. 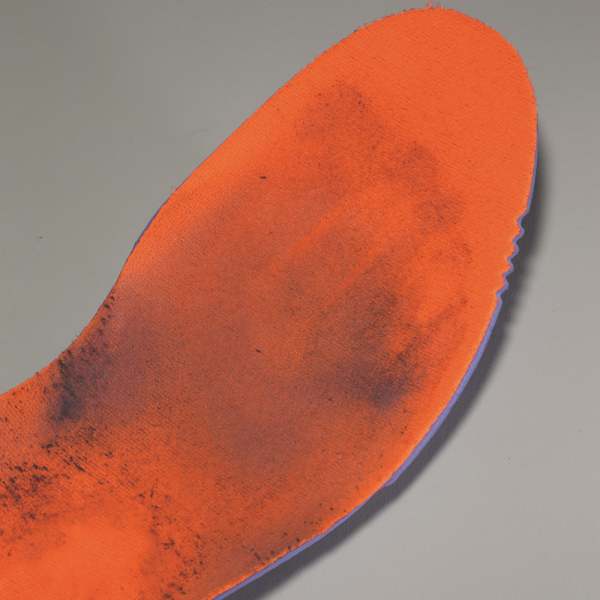 Underfoot pressure mapping obtained from wear trials has been replicated in the walking foot during Pedatron testing. This article highlights some of the current uses of the STM 528 Pedatron. SATRA TM362:2014 – ‘Abrasion resistance of soles – biomechanical method’ was originally developed for the assessment of abrasion resistance of soling materials using the Pedatron. A typical test duration is 12,000 steps (accomplished on the Pedatron in about eight hours with intermittent examinations), which equates to a walking distance of approximately 24km. This usually provides sufficient information about the rate of wear of the sole material. However, extended numbers of steps can be used to assess more arduous wear or to determine the ultimate life of the sole. The test is carried out on a specified abrasive surface, although a wide range of other test surfaces can be installed if required. Assessment of the footwear tested to SATRA TM362 is by mass loss (mainly due to material abrasion from the sole), although the results can be supplemented by measurements of thickness loss and photographic evidence of the soles before and after a test. In addition to the vertical loads applied to the footwear during walking, the Pedatron test reproduces the horizontal forces which are applied to footwear as would be found in actual wear. These horizontal forces result in shear stresses through the bottom construction of the footwear. Such forces can show up weaknesses in design which would not necessarily come to light with either a traditional flexing test or impact test. During the test, the floor surface turns every other step while under load. This induces torsional shear loads into the test specimen as also found in actual wear. The design of the STM 528 Pedatron allows a realistic footwear response to the applied loads. As the vertical loads are applied by means of a mass, the footwear is allowed to compress and recover, as would be the case in walking. 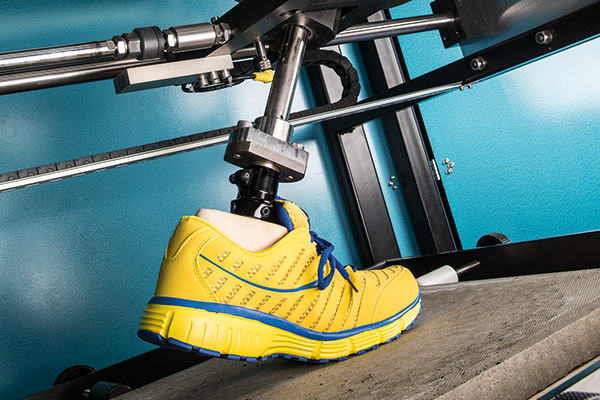 When a Pedatron test is conducted, a flexible and compressive prosthetic foot form fills the interior of the shoe. This representation of the foot produces realistic pressures inside the footwear, which gives a good indication of the durability of underfoot components in addition to the sole, such as footbeds, midsoles and the ribs in cavity units. The advantage when assessing these components is that they are tested in the context of completed footwear, so the effect of the components acting together in a simulated walking situation is evaluated. 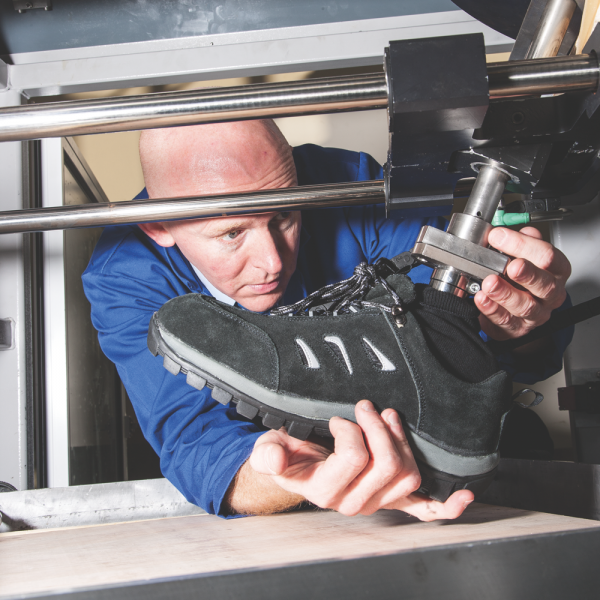 The Pedatron has also been found to be effective as a key test machine in a footwear ageing protocol developed by SATRA. When conducting a simulated wear assessment test (‘SWAT’), controlled amounts of moisture and heat are introduced to the test sample to simulate foot perspiration, using the SATRA STM 567 Endofoot machine. The test sample is then subjected to a period of Pedatron testing. Depending on the footwear application, drying cycles and other treatments can be introduced to simulate the environment the footwear would encounter in real-life situations. Blocks of testing within the protocol can be repeated or adapted, depending on the application. The ageing protocol has been found to be very effective in identifying both design problems and manufacturing inconsistencies for a range of footwear types and components. This protocol, including its elements of Pedatron testing, gives a consistency which is difficult to reproduce in human wear trials, and allows small design or manufacturing variants to be effectively assessed. It can be used for benchmarking products and, when used to audit production samples, allows a realistic indication of when premature failures may occur. 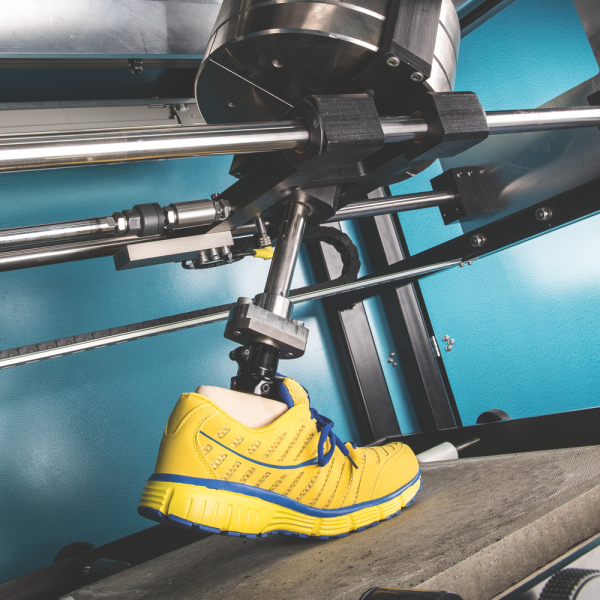 Pedatron testing on its own or as part of an accelerated ageing test sequence can also be used for pre-conditioning footwear before other tests are carried out – for example, prior to a water resistance test or a slip resistance test. This allows these characteristics to be assessed after a period of simulated use of the footwear. Another ‘spin-off’ test which was identified for the Pedatron a number of years ago is its ability to give realistic floor surface wear results. Since that time, SATRA has offered a service through the SATRA flooring business unit testing the wear resistance of flooring surfaces. The floor surface turns incrementally during the test, producing a circular wearing area on the floor surface. By using a specimen made of different surfaces across the contact area, various flooring surfaces can be tested at the same time, giving comparative wear results between them. A typical Pedatron flooring test would feature one million step cycles. Members of SATRA’s research team are continuing to find new applications for the Pedatron in the evaluation of footwear. These include using the Pedatron to measure the torsional loads found to occur between the footwear sole and a particular type of flooring surface. This is a valuable way to assess the torsional friction and, therefore, the torsional loads applied to the leg by a particular footwear design and floor combination. This is proving particularly valuable in the assessment of studded sports footwear used on soft playing surfaces. From its early days as a research test machine, the STM 528 Pedatron has evolved into a reliable and effective test machine, capable of running continuously for 24 hours a day. Experience of many millions of step cycles has been gained by the SATRA teams in its test and research laboratories using the more recent models of Pedatron for footwear evaluation. 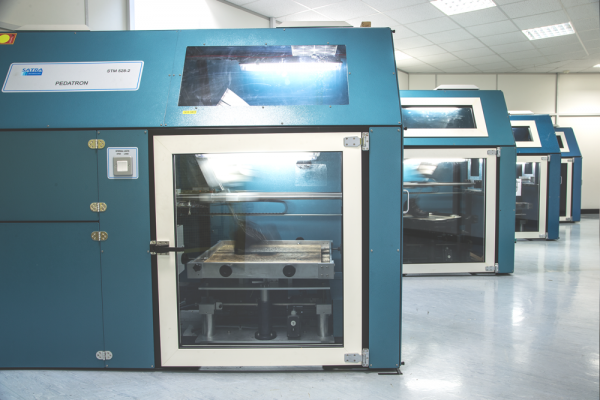 SATRA has seven STM 528 Pedatrons operating in its own laboratories on a daily basis – five conducting footwear tests and two for flooring tests. Operating a Pedatron is not labour intensive. Apart from setting up the test initially and inspection of the test samples at the end of blocks of testing cycles, the machine can run unsupervised. SATRA is currently experiencing strong interest from customers for the purchase of the Pedatron currently for both footwear and flooring testing. If you have an application where you believe Pedatron testing could be of interest for the evaluation of whole footwear or components within footwear construction, please email SATRA’s footwear testing team (footwear@satra.com). Alternatively, contact test.equipment@satra.com to discuss the purchase of a SATRA STM 528 Pedatron. This article was originally published on page 44 of the January 2016 issue of SATRA Bulletin.